Book Buzz is a promotional newsletter supported by the publisher. Allen & Unwin is thrilled to be publishing a new novel from Dominic Smith, the award-winning author of acclaimed bestseller The Last Painting of Sara de Vos. The Electric Hotel is a luminous new novel tracing the intertwined fates of a silent film director and his muse. Paris, 1895: 20-year-old Claude Ballard interviews for a job as a ‘concession agent’ for the Lumière Brothers. With a CV, such that it is, that contains film of his sister’s dying breaths, it’s clear how much Claude will put at stake to realise his dreams … When Claude meets legendary actress Sabine Montrose, during the last hours of her 40th birthday in her Manhattan hotel room, inspiration strikes and his fate is sealed. Los Angeles, 1962: For nearly half a century, Claude Ballard has been living at the Hollywood Knickerbocker Hotel. A French pioneer of silent films, Claude now spends his days foraging mushrooms in the hills of Los Angeles and taking photographs of runaways and the striplings along Sunset Boulevard. But when a film-history student comes to interview Claude about The Electric Hotel—the lost masterpiece that bankrupted him and ended the career of his muse, Sabine Montrose—the past comes surging back. In his run-down hotel suite, the ravages of the past are waiting to be excavated: celluloid fragments and reels in desperate need of restoration, and Claude’s memories of the woman who inspired and beguiled him. Spanning three continents and the best part of a century, Dominic Smith takes us on a tour of the heart, to Paris, Manhattan, Brooklyn, the Palisades, Los Angeles, Belgium, Andorra and our very own Tamarama. 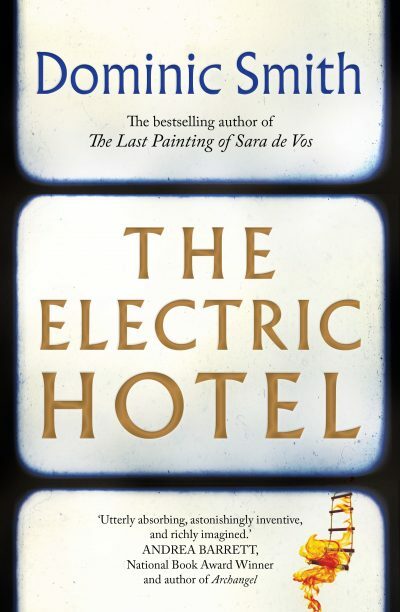 Breathtaking, epic and intimate, The Electric Hotel is the new literary masterpiece from the author of the award-winning The Last Painting of Sara de Vos. I stayed up all night reading The Electric Hotel and can still instantly conjure the thrill of being lost in its pages. It is one of those very rare books that combines breakneck suspense and action with the most extraordinary literary sensibility. Dominic could write a riveting literary novel in which nothing happens, but here he has written a riveting literary novel in which everything happens, and it is a wonder! I was overwhelmed by your support and enthusiasm for The Last Painting of Sara de Vos. As I met with booksellers in Sydney, Melbourne, Brisbane and beyond, I was struck by how much the bookstore (or the bookshelves within a store) matters to the life of a community, a city, a nation. So thank you for all you do to support the culture of books and writing! I’m excited to share with you a little about my new novel, The Electric Hotel, which will be published by Allen & Unwin in June of 2019. This is the story of a lost silent film that ruined the French director and famous actress who made it. For decades, the only celluloid print for the film has been crumbling inside a metal trunk under Claude Ballard’s bed at the run-down Hollywood Knickerbocker Hotel, where Claude is living out his eighties. The film is rediscovered when a graduate student comes to interview its creator in the 1960s. As the film undergoes restoration, we learn about Claude’s doomed obsession with moviemaking and the French stage actress who goes on to star in his films. We follow Claude as a young concession agent for the Lumière brothers, the inventors of cinema in the 1890s, and witness his moviemaking travels to Australia. (In real life, the Lumières sent an agent named Marius Sestier, whose first reels included footage of the 1896 Melbourne Cup; his reels can be seen here.) Claude also films a young daredevil in action at the Royal Aquarium and Pleasure Grounds in Tamarama (I spent my teenage years in Bondi and walked past the historic plaque commemorating the site of the Pleasure Grounds countless times.) This daredevil, Chip Spalding, becomes the first professional stuntman in the world of early silent films. With Claude’s filmmaking family in place—a producer and hustler from Brooklyn, an Australian stuntman, a famous French stage actress—he goes on to build a prolific studio above the cliffs of Fort Lee, New Jersey, America’s first movie town and where the term cliffhanger originates. By 1910, we follow Claude’s plans to make an epic film, an hour-long dark melodrama entitled The Electric Hotel, which will go on to be considered his cinematic masterpiece. But why did the film only run for two weeks after its release? And why did Claude Ballard and the film’s famous star, Sabine Montrose, never work again? Naturally, dear reader, the answers are in the book, and I hope you’ll turn the pages to find out. A silent film festival in northern Italy, a trip to the archives at the Library of Congress, a walk through the Lumière brothers’ family home in Lyon (now a museum), a visit to Belgium to retrace the steps of early WWI cinematographers—the research for this book was an immersion in pictures and places. Along the way, my perception of early silent films changed completely. These were not all jittery pantomimes and melodramas; many were indelible works of art. If 75 percent of all silent films have been lost (the estimate from the Library of Congress) then what jewels have vanished? That was the question that drove this novel. Dominic grew up in Sydney and now lives in Austin, Texas. He is the author, most recently, of The Last Painting of Sara de Vos, an acclaimed bestseller in Australia, winning both the ABIA Literary Fiction Book of the Year and the Indie Book of the Year (Fiction) in 2017. The novel was a New York Times (NYT) bestseller in the US and named the NYT Book Review Editors’ Choice. It was also named in the Best Books of 2016 by both Amazon and Kirkus. Be one of the first to read The Electric Hotel. Email us at marketing@allenandunwin.com for your chance to receive a proof copy.